Designed specifically for light sport (LSA) and experimental aircraft the GTR 200’s combine powerful Comm capabilities with advanced workload-reducing features formerly only found in high-end certified systems. 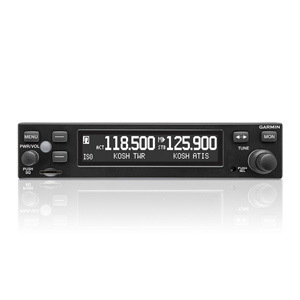 Its slim 1.35” tall design allows you to make the most of limited space in your panel while 10 W of transmit power helps ensure solid communications between you and ATC or other aircraft in your vicinity. Information displays on the large, sunlight-readable display with brightness levels that can adjust automatically to the natural light level in the cockpit, or can be adjusted manually by the pilot. The GTR 200’s offer 25 kHz channel spacing and utilizes a standard density 37-pin connector for easy installation. In addition to auto squelch, stereo intercom, alert inputs and standby frequency monitoring, the GTR-200B offers Bluetooth connectivity allows pilots to connect a smart phone or tablet to easily make phone calls and listen to audio entertainment. GTR-200B also has Garmin’s 3D Audio Processing, spatially separating incoming audio to reflect how people process sound and conversation by differentiating audio sources and their unique locations/seat positions within the aircraft.